An Android Intent is an abstract description of an operation to be performed. It can be used with startActivity to launch an Activity, broadcastIntent to send it to any interested BroadcastReceiver components, and startService(Intent) or bindService(Intent, ServiceConnection, int) to communicate with a background Service. The intent itself, an Intent object, is a passive data structure holding an abstract description of an operation to be performed. For example, let's assume that you have an Activity that needs to launch an email client and sends an email using your Android device. For this purpose, your Activity would send an ACTION_SEND along with appropriate chooser, to the Android Intent Resolver. 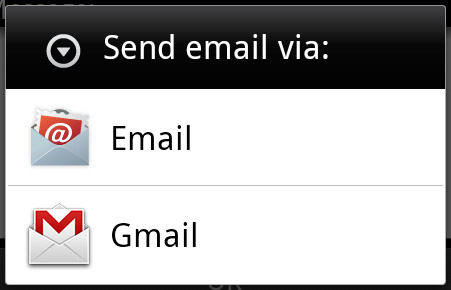 The specified chooser gives the proper interface for the user to pick how to send your email data. 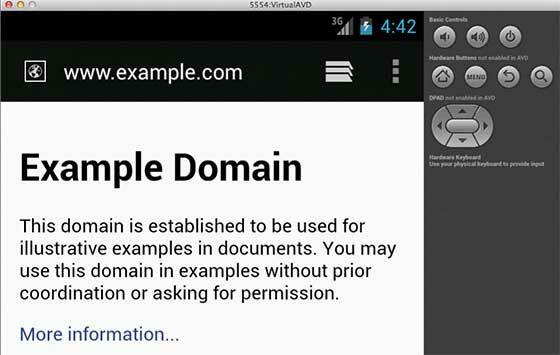 For example, assume that you have an Activity that needs to open URL in a web browser on your Android device. 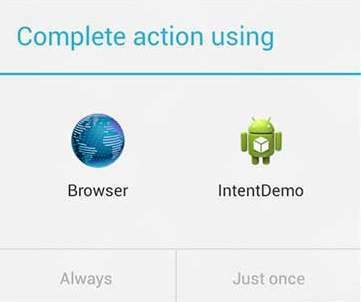 For this purpose, your Activity will send ACTION_WEB_SEARCH Intent to the Android Intent Resolver to open given URL in the web browser. The Intent Resolver parses through a list of Activities and chooses the one that would best match your Intent, in this case, the Web Browser Activity. The Intent Resolver then passes your web page to the web browser and starts the Web Browser Activity. There are separate mechanisms for delivering intents to each type of component - activities, services, and broadcast receivers. 1 Context.startActivity() The Intent object is passed to this method to launch a new activity or get an existing activity to do something new. 2 Context.startService() The Intent object is passed to this method to initiate a service or deliver new instructions to an ongoing service. 3 Context.sendBroadcast() The Intent object is passed to this method to deliver the message to all interested broadcast receivers. 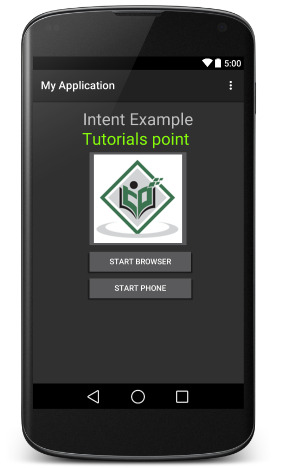 An Intent object is a bundle of information which is used by the component that receives the intent as well as information used by the Android system. The action in an Intent object can be set by the setAction() method and read by getAction(). The setData() method specifies data only as a URI, setType() specifies it only as a MIME type, and setDataAndType() specifies it as both a URI and a MIME type. The URI is read by getData() and the type by getType(). 1 ACTION_VIEW content://contacts/people/1 Display information about the person whose identifier is "1". 2 ACTION_DIAL content://contacts/people/1 Display the phone dialer with the person filled in. 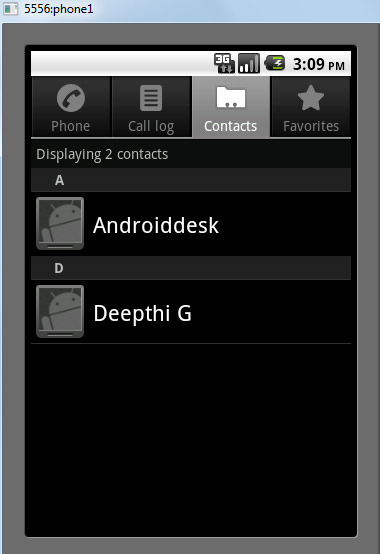 3 ACTION_VIEW tel:123 Display the phone dialer with the given number filled in. 4 ACTION_DIAL tel:123 Display the phone dialer with the given number filled in. 5 ACTION_EDIT content://contacts/people/1 Edit information about the person whose identifier is "1". 6 ACTION_VIEW content://contacts/people/ Display a list of people, which the user can browse through. The category is an optional part of Intent object and it's a string containing additional information about the kind of component that should handle the intent. The addCategory() method places a category in an Intent object, removeCategory() deletes a category previously added, and getCategories() gets the set of all categories currently in the object. Here is a list of Android Intent Standard Categories. You can check detail on Intent Filters in below section to understand how do we use categories to choose appropriate activity corresponding to an Intent. These flags are optional part of Intent object and instruct the Android system how to launch an activity, and how to treat it after it's launched etc. 1 FLAG_ACTIVITY_CLEAR_TASK If set in an Intent passed to Context.startActivity(), this flag will cause any existing task that would be associated with the activity to be cleared before the activity is started. That is, the activity becomes the new root of an otherwise empty task, and any old activities are finished. This can only be used in conjunction with FLAG_ACTIVITY_NEW_TASK. 2 FLAG_ACTIVITY_CLEAR_TOP If set, and the activity being launched is already running in the current task, then instead of launching a new instance of that activity, all of the other activities on top of it will be closed and this Intent will be delivered to the (now on top) old activity as a new Intent. 3 FLAG_ACTIVITY_NEW_TASK This flag is generally used by activities that want to present a "launcher" style behavior: they give the user a list of separate things that can be done, which otherwise run completely independently of the activity launching them. 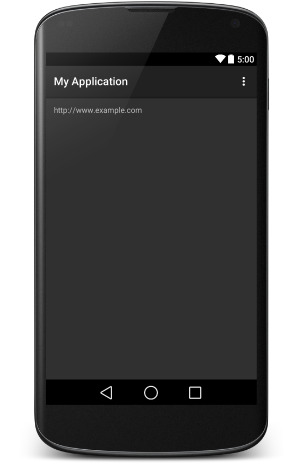 This optional field is an android ComponentName object representing either Activity, Service or BroadcastReceiver class. If it is set, the Intent object is delivered to an instance of the designated class otherwise Android uses other information in the Intent object to locate a suitable target. The component name is set by setComponent(), setClass(), or setClassName() and read by getComponent(). 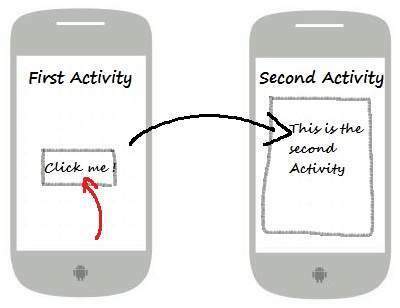 Explicit intent going to be connected internal world of application,suppose if you wants to connect one activity to another activity, we can do this quote by explicit intent, below image is connecting first activity to second activity by clicking button. 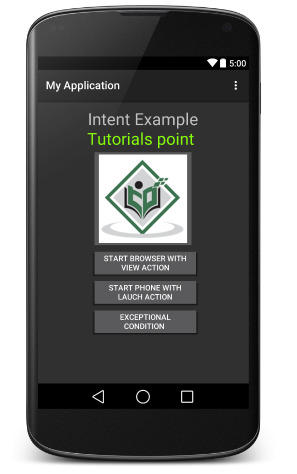 Following example shows the functionality of a Android Intent to launch various Android built-in applications. 1 You will use Android studio IDE to create an Android application and name it as My Application under a package com.example.saira_000.myapplication. While creating this project, make sure you Target SDK and Compile With at the latest version of Android SDK to use higher levels of APIs. 2 Modify src/main/java/MainActivity.java file and add the code to define two listeners corresponding two buttons ie. Start Browser and Start Phone. 3 Modify layout XML file res/layout/activity_main.xml to add three buttons in linear layout. Following is the content of the modified main activity file src/com.example.My Application/MainActivity.java. Similar way you can launch phone interface using Start Phone button, which will allow you to dial already given phone number. You have seen how an Intent has been used to call an another activity. Android OS uses filters to pinpoint the set of Activities, Services, and Broadcast receivers that can handle the Intent with help of specified set of action, categories, data scheme associated with an Intent. You will use <intent-filter> element in the manifest file to list down actions, categories and data types associated with any activity, service, or broadcast receiver. Once this activity is defined along with above mentioned filters, other activities will be able to invoke this activity using either the android.intent.action.VIEW, or using the com.example.My Application.LAUNCH action provided their category is android.intent.category.DEFAULT. The <data> element specifies the data type expected by the activity to be called and for above example our custom activity expects the data to start with the "http://"
There may be a situation that an intent can pass through the filters of more than one activity or service, the user may be asked which component to activate. An exception is raised if no target can be found. A filter <intent-filter> may list more than one action as shown above but this list cannot be empty; a filter must contain at least one <action> element, otherwise it will block all intents. If more than one actions are mentioned then Android tries to match one of the mentioned actions before invoking the activity. A filter <intent-filter> may list zero, one or more than one categories. if there is no category mentioned then Android always pass this test but if more than one categories are mentioned then for an intent to pass the category test, every category in the Intent object must match a category in the filter. Each <data> element can specify a URI and a data type (MIME media type). There are separate attributes like scheme, host, port, and path for each part of the URI. An Intent object that contains both a URI and a data type passes the data type part of the test only if its type matches a type listed in the filter. Following example is a modification of the above example. Here we will see how Android resolves conflict if one intent is invoking two activities defined in , next how to invoke a custom activity using a filter and third one is an exception case if Android does not file appropriate activity defined for an intent. 1 You will use android studio to create an Android application and name it as My Application under a package com.example.saira_000.myapplication. While creating this project, make sure you Target SDK and Compile With at the latest version of Android SDK to use higher levels of APIs. 2 Modify src/Main/Java/MainActivity.java file and add the code to define three listeners corresponding to three buttons defined in layout file. 3 Add a new src/Main/Java/CustomActivity.java file to have one custom activity which will be invoked by different intents. 4 Modify layout XML file res/layout/activity_main.xml to add three buttons in linear layout. 5 Add one layout XML file res/layout/custom_view.xml to add a simple <TextView> to show the passed data through intent. 6 Modify AndroidManifest.xml to add <intent-filter> to define rules for your intent to invoke custom activity. Following is the content of the modified main activity file src/com.example.My Application/CustomActivity.java. android:text="Start browsing with view action"
android:text="Start browsing with launch action"
Now let's start with first button "Start Browser with VIEW Action". Here we have defined our custom activity with a filter "android.intent.action.VIEW", and there is already one default activity against VIEW action defined by Android which is launching web browser, So android displays following two options to select the activity you want to launch.